Lent is not an effort to save ourselves. We have been saved by Jesus’ one and perfect sacrifice. It’s time to spill the beans. Lent isn’t only for grown-ups. 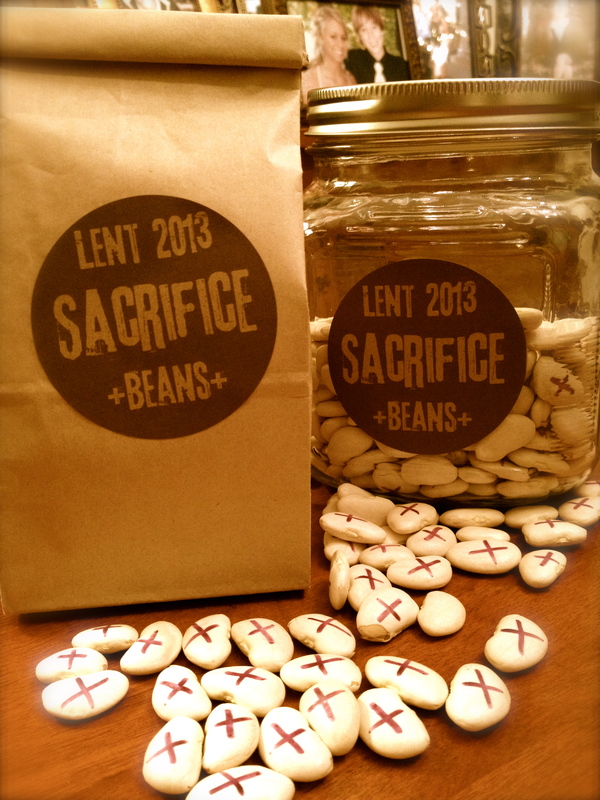 The church season of Lent is the perfect time to bring faith home, especially with meaningful intergenerational activities like Sacrifice Beans. Even in the midst of our mortality, the days are getting longer. The sun is burning brighter. And the 40-day journey to Easter is meant to be traveled together! Sacrifice Beans teach a life of sacrifice and serving that begins in the home and spills out into the world. Jesus’ life, death and resurrection remind us what it means to bear the mark of the cross in our everyday lives. Beans are seeds. Like most seeds they appear to be dead. Yet school-age children bury these “dead” seeds in dirt-filled milk cartons and in recycled paper cups every year, most kids filled with blissful hope that somehow, mysteriously, these beans will spring forth to new life. Similarly, what at first might seem like an elementary exercise in bean-counting reveals a hope-full way of living in response to Jesus’ perfect sacrifice; a life defined by giving rather than grabbing, self-sacrifice rather than self-preservation. Kids learn best through play. So even if they won’t touch their beans at dinner, they’ll gladly play with them during Lent. As long as everyone understands we do these things because of what Christ has already done and not to save ourselves or to earn love that is unconditionally ours, Sacrifice Beans are wonderful way to nurture and grow faith! If using lima beans, work together to mark a cross on each bean with purple permanent marker. Remind everyone that we are God’s children in Baptism; that we’ve been sealed with the Holy Spirit and marked with the cross of Christ forever. Nothing can separate us from God’s love; not even death. During Lent when family members sacrifice time, talent or treasure for someone else’s good or the good of creation, another person places a Sacrifice Bean in a specially designated jar or dish. Surprise children on Easter morning by replacing Sacrifice Beans with Alleluia Beans (Jelly Beans) to celebrate the Resurrection of Our Lord. 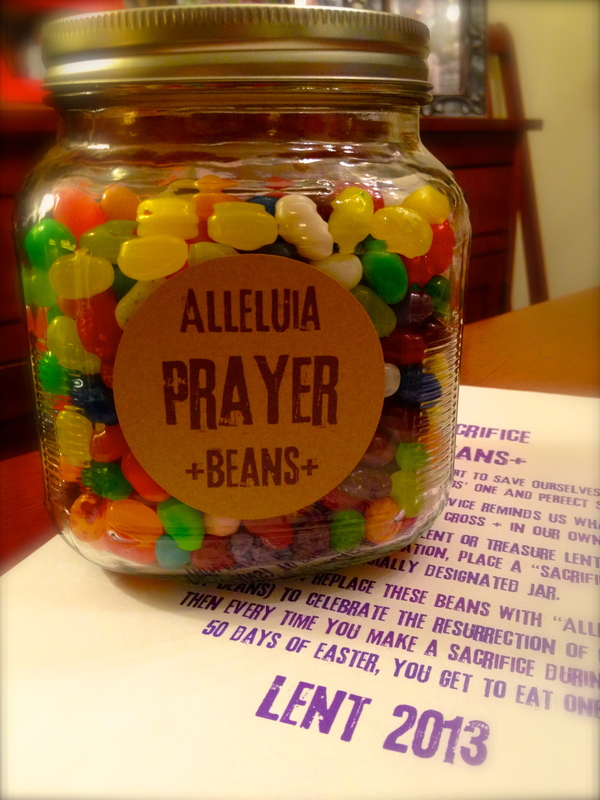 Then every time anyone makes a sacrifice during the 50 days of Easter, that person gets a treat (we use Jelly Belly beans with special prayers for each of the 49 flavors). For older children or sugar-conscious parents, beans can also be replaced with coins, to be shared as an offering on Easter morning.